There's laws against it [racism] now. Both racist and homophobic chants are illegal and rightly so. Football is such a multicultural event now, and there's education for future fans which is changing views..."
As part of a range of activities to celebrate Black History month and highlight the hidden histories which denote the contributions of black people to society, Show Racism the Red Card interviewed Howard Gayle. The former Liverpool FC winger was the first black player ever to play for the reds; blazing a trail for his close friend John Barnes and countless other players to follow. Howard went on to play for Blackburn Rovers, Newcastle United and Sunderland AFC, and now works to support disenfranchised young people in Liverpool and throughout the North West. 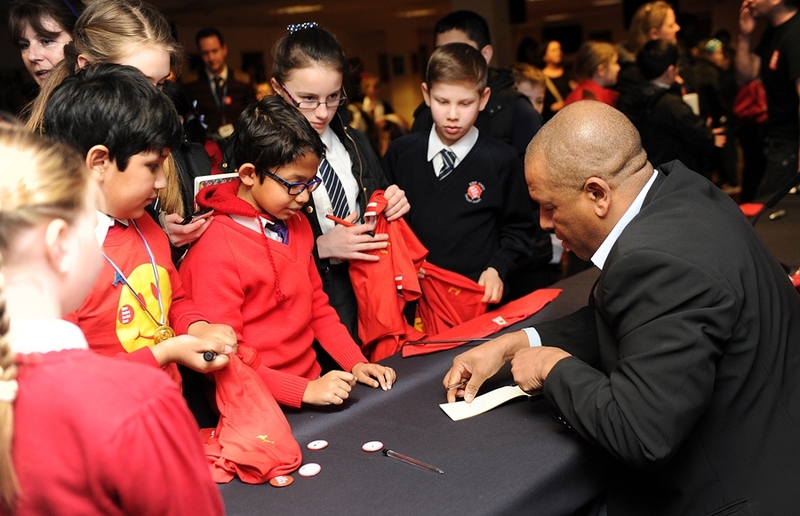 Howard is also a patron and ambassador for Show Racism the Red Card; taking part in a huge number of educational events with young people and sharing his extraordinary story and experiences. He was inducted into the Show Racism the Red Card Hall of Fame in 1998 in recognition of his contribution to anti-racism campaigning. Howard’s unique status as a pioneer and role model has seen him recognised as part of the Black Achievers Wall in the International Slavery Museum, Liverpool. Creating history is something that Liverpool FC are familiar with, certainly for fans in the 1980s - the club was facing a golden era of football. For Toxteth born striker, Howard Gayle, it wasn't just history being made in terms of trophies won, it was also a milestone of the field, as he became the first black player to represent the reds. "I was the first black player and it was a fantastic achievement for me...", explained Gayle, "The fans were brilliant as well." Continuing, the striker said: "I had been on the terraces as a youngster, so they'd have known me from that"
While well received in his hometown, it wasn't always a level playing field, as abuse from the stands was rife during this period of football. "For away fans, I was the enemy", explains the Toxteth striker, "racial abuse was just part of the norm." It wasn't just the view of the terraces however, as such attitudes were display on as well as off the field. "Players would use it [racism] as a tool to put you off your game, it was part and parcel of the game and you just took it." As far as today's common standards apply, the game has experienced mass change in regards to the former Liverpool striker's experiences. "I've been stood with a ref before and he's just shrugged his shoulders." Where there is rules within football and laws amongst society, back then for a footballer, "... the best thing to do was to play well, you could go past with a smile." After signing a professional contract with the Merseyside club, Gayle played an integral part in his side's 1980-81 European Cup semi-final against Bayern Munich. Earning a winners' medal at the end of that season, Gayle went on to represent both Newcastle United and Sunderland in the North East of England. While faced with difficulties in his career, beyond that of his own control, the European Cup winner suggests: " There's been major improvements [in football]. There's laws against it [racism] now. Both racist and homophobic chants are illegal and rightly so." He continued: " Football is such a multicultural event now, and there's education for future fans which is changing views..."
For Gayle: "... traits are being forgotten, differences are being accepted and cultures are starting to be diversified."